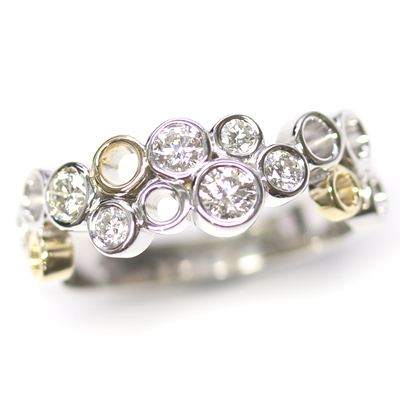 9ct White and Yellow Gold Multi Circle Diamond Dress Ring — Form Bespoke Jewellers Ltd.
A bespoke multi circle diamond dress rings cast in both yellow and white gold. The customer came to us with a unique multi circle design which would provide them with the ability to add more diamonds to it in the future. They also knew that they wanted to use both white gold and yellow gold so that it would be in-keeping with their partner’s current jewellery collection. Alongside our expert jewellers, their bespoke dress ring design evolved and was then created on CAD. 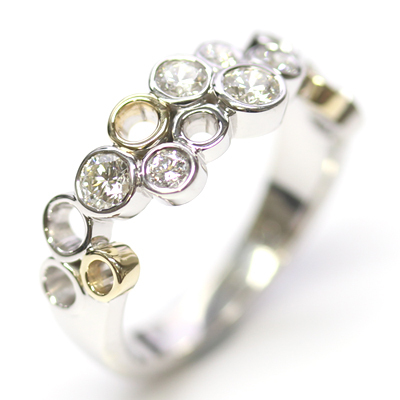 The design was then sent to our reputable casters who then cast the 9ct white gold piece and the 9ct yellow gold pieces. On it’s return to us, the cast pieces were hand soldered together to create the base of their finished dress ring design. The customer chose where they would like to place the first collection of round brilliant cut diamonds (all of matching colour and clarity). By leaving some of the circles empty, there is still room to hand set more diamonds at a later stage.